Miami Thriller, Miami's #1 Sightseeing Tour and Boat Ride, Bay Ex-Cape, Miami's premier public sightseeing cruise and tours including the Millionaire's Row boat tour of Miami Beach and Port of Miami available 7 days a week departing from the Thriller - Celebration docks, Bayside Marketplace, Downtown - Miami, Coconut Grove, Florida. All Sightseeing boat tours depart at 11am - 12:30 - 2:00 - 3:30 - 5:00 & 6:30pm on a daily basis and have bi-lingual narration w/full bar, beverage and snacks onboard. Bay Rock, our evening party dance cruises and boat tours are available Friday, Saturday and Sunday at 9 and 11 pm. Tour Operators and groups welcome. All sightseeing boat tours are U.S. Coast Guard Inspected and Licensed. miami dinner cruise, miami dinner cruises, miami yacht charter, florida yacht charter, florida dinner cruise, florida day cruise, miami dinner cruise, miami charter boat, florida cruise, south florida yacht charter, corporate yacht charter, corporate cruise, florida yacht rental, miami yacht rental, south florida yacht charter, yacht charter, luxury motor yacht, private yacht, charter motor yacht, charter, luxury motor yacht charter, south florida wedding, wedding yacht charter, miami wedding charter, cruiseing, cruising, wedding cruise, dinner cruise, diner cruise, 3 hour cruise, 4 hour cruise, bayfront cruises, bayfront dinner cruise, bayfront diner cruises, south beach, FL, Bayside Marketplace, fort lauderdale, ft. lauderdale charter boats south florida, party boats, party yachts, party yacht, party dinner yachts, party dinner cruise boats, boat rentals, charter boat rentals, boatmiami, boating in miami, yachts, dinner cruises, charter dinner cruises, cruises, sightseeing cruises, luncheon cruises, miami cruising yachts, miami dinner cruising, dinner, cocktail cruises, dinner cruising yachts, dinner cruising, cruising yachts, cruising boats, miami party boats, parties in miami, boat, party, fort lauderdale party boats, dinner cruise party boats, miami partiescharter yacht miami, cruises miami, miami dinner cruise. 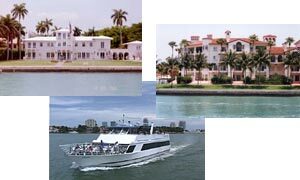 Public and private sightseeing boat tours and trips available cruising Biscayne Bay, Miami and Miami Beach. Thriller, our hi-speed powerboat sightseeing depart daily from Bayside Marketplace. 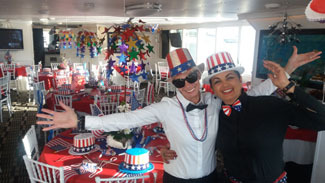 Private Bay Escape and Bay Brunch sightseeing lunch cruises operate from Dinner Key Marina, Coconut Grove, Florida. Tour operators and private group activity are welcome with group rates. Member of the Miami and the Beaches Convention Bureau, Miami, Florida. Our Miami dinner cruises and Fort Lauderdale Dinner Cruise charter yachts are Owner Operated offering personalized services for corporate, conventions, meetings and private on the water events departing from Dinner Key Marina, Coconut Grove, Florida and Bayside Marketplace, downtown Miami, Florida. Our yacht charter consultants are very knowledgeable in planning your dinner cruise, dinner cocktail parties, theme cruises, deep sea fishing events, Day sailing adventures and High Speed Thriller cigarette boat tours. Our dinner cruises sailing boats and Thriller powerboat sightseeing tours are designed for groups From 6 to 500 guests. 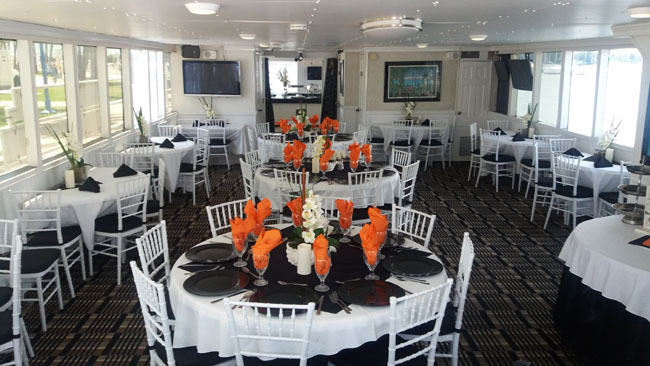 Our dinner cruise menus, include onboard food service, bar and beverage and M/C and host to oversee the event. Miami & Miami Beach, Fl.